May the words of my mouth and the meditations of all our hearts, be acceptable to you, O Christ, our rock and our Redeemer. Amen. Good morning, St. Augustine’s! It is good to be together today after the week we have had between pipe bombs, the final laying to rest of Matthew Shepard, and now the aftermath of the terrorist attack on our Jewish siblings in Pittsburgh. These events, they hit close to home, all of them, and so I thank you for holding the space of silence this morning and reciting together the prayer of St. Francis, as we remember and wait, and help in all the ways we can in the weeks ahead. Our work together remains important now as ever, and so this morning, I wanted to talk about our Annual Giving Campaign as we are now at the halfway mark. As you might have read in the Parish Newsletter this week, we have to date 43 pledges, out of 119 from last year, and of these 43 pledges, 53% have grown from last year! This is good news! And, we are hoping to find at least 66 more so that we can plan for our year ahead and all the many things that we do together for the life of our church, and our world. And so for today, it is my hope that we find in our biblical narrative another way to see how vision and giving go hand in hand, and that we find what piece of this vision we can fulfill as our portion. The gospel today highlights a person called, Bartimaeus, who is willing to bring everything he has to live into a vision for a future. He is a person who has lived faithfully, in so many ways, but comes looking for actual vision—and the scripture says that he comes—“again”—so we know that at one point he did have vision. “Jesus, Son of David, have mercy on me!” he yells to Jesus—who he believed was the Messiah, the one who has provided the vision for his faith, and the one who can lead him again into a new vision for his life. Like many things in our life—unfortunate circumstances, struggles, or even shame—they keep us from throwing ourselves into relationship with others—they even can become things we don’t want to share with God. Bartimaeus was no different. Everyone around Bartimaeus encouraged him to keep a healthy distance, to remain quiet focusing only on what was at hand and to leave Jesus alone. But Bartimaeus was really hungry—hungry for a vision that would not only change his life—but bring change to the world. Bartimaeus identified his own need for mercy, and he believed that Jesus could actually help him and that this Jesus had something that could change all of us, too. He understood that his own experiences in life were not because of anything God did to harm him, but that despite his circumstances God used him. His experience was the only currency he had to share with God’s kingdom. When we look at Bartimaeus’ story, we see that there are clearly many things he could have asked Jesus for. He was a beggar—he could have asked for food—for shelter—for any other number of things—but he asked for new vision—he asked to see the way again. He asked for a vision that stems from his faith and the grace to live out such vision. Bartimaeus understood that our God is one who cares for the poor and the brokenhearted, the destitute, and frustrated. This is the God our Psalmist sings about today—that there is a vision to live into and a promise of blessing from the God who holds us and leads us. We see a God working through all of our brokenness, so that we might live into our faith and into one another more richly. We see a God who casts vision for our shared life, putting before us the needs of this world and putting in us the resources and vision to make a way out of no way, and to find our work in this the holiest of mysteries. Bartimaeus found hope in the vision of his Lord. He found hope in the work of the body, coming together to right the wrongs of this world, to change dyer circumstances into livable ones, and to live into a grace that makes room for everybody, everybody, everybody. And do you see what happens at the end of the passage? Bartimaeus follows Jesus. He asks for vision, again, he receives it, and it changes how he lives in the world. We too, ask for God’s vision; and living into it, and participating in it requires us to give sacrificially so that our work together can continue. 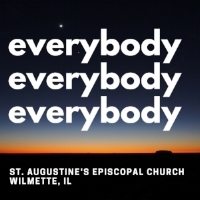 My vision is that we continue to be a community where everybody, everybody, everybody is welcomed; and that the work of loving and healing the world remains central to the work we do together. Beloveds, it is quite simple: we love God, we love one another, and whatever work it is that we are doing together, we continue together, and we do it conviction and grace. Do you know all the ways this happens in our community? I have seen this vision lived out and I have seen this vision take root, and transform not only the people we serve—but I have seen it change us! We see this in our work with Family Promise—and the satisfaction that we have knowing at least one less family is on the streets and that we can have a hand in meeting their basic needs. We hear stories of when past participants give updates, or return for trick-or-treating—because let’s face it—we give away really good candy! We see this in the work we share with A Just Harvest Soup Kitchen—and the satisfaction that we have knowing that people will go to bed with full stomachs, feeling cared for and tended to. We show up, even when it is a stretch in our long days, and we give because our money really makes a difference! We see this in the too numerous ministries we support through the Mission Grant Outreach program, where we know that all over Chicagoland, our dollars are providing basic needs and services to marginalized groups of people. We see this in the ways we participate in diocesan ministries with world wide outreach and mission, and by supplementing the work of smaller parishes in rural areas doing really beautiful work. We see this in the support you offer to your clergy enabling us to reach out to those traumatized by violence and then gather around those acts of injustice and work for change. In that moment, and in many others, too, ALL of you were with me hugging this teary-eyed man and welcoming him after years of unwelcome in his own church. All of our work together is missional, all of it is evangelism, and all of it matter. And let’s not forget all the many ways that the time we spend together, whether in fellowship or formation, forms us to become the people of faith that seek to do justice, love mercy, and walk humbly with our God. Beloveds, I’ve seen this vision, and I know it to be true of this place. It is not only our many ways of outreach, but it is also the ways that we care for and tend to one another. It is the beautiful funerals we prepare together; it includes the meals and help we offer one another; and its in all the many ways we surround one another when life requires it. That vision is compelling to me, and it is why I am at St Augustine’s, and why I give of my own financial resources. This year, I have decided to increase my pledge from last year. I have decided to give in a way that is noticeable in my budget, and is a sacrifice—but a sacrifice I know is worth making for the vision I believe in. As your pastor, I care about all our relationships to money both as individuals and as a church. Money has so much power over how we think of ourselves, that it can become something we only deal with in private. If you are worried about your finances or are financially insecure, I am happy to have a private conversation with you about it. If pledging seems too difficult to imagine in this current financial season—pledging even $10—is still a pledge and it is still a step in participating in the vision of this community and it helps us all walk further into that call with confidence. While money may be an uncomfortable subject to talk about, it is a necessary part of our living and our being both as individuals and as the body of Christ. It is a tool that we have to build the kingdom of God, to live into the vision we have for this church and our world. Our money is how we make our vision of this church a reality. Once God has given us a vision, we are invited into carrying that vision forward - following Jesus and giving of our selves—and our money. Our financial gifts enable us to have a place to gather, liturgy to share, and mission to live into with our whole being. As your priest, I see a vision for how all of our gifts are used to change the world we share, and I see all the many ways that our gifts can change the future of this community that we love. Surely, we have to pay our utilities, we have unplanned expenditures like boilers and furnaces, and we also have salaries of those who help to lead us—but living into our mission and outreach requires all of us to give sacrificially. This week, has been a heavy week. For those of you who listened or watched the service of burial for Matthew Shepard, you too heard the welcoming words of Bishop Gene Robinson, when he said, “Many of you have been hurt by your own religious communities, and I want to welcome you back.” The Bishop’s words reminded me of the importance the three words “everybody everybody everybody” has in our identity, and how those words cast a vision for how we, St. Augustine’s, wants to be in this world together and as servants. And living into these words requires sacrifice and heart—two things we can share. Yesterday’s news of the shooting at Tree of Life in Pittsburg, is yet another reminder of the work we have to share. It is work that stems from our baptismal covenant, it is work that calls us to shine the light we have and quell the darkness. Bishop Sean Rowe of the Episcopal Diocese of Northwestern Pennsylvania released a statement where he said: “In circumstances such as these the church has one mission: to comfort the afflicted, to sow seeds of peace, and to advocate for justice. In prayerful humility, let us be about it.” I couldn’t agree with him more. Let us be about it. The work we have begun together, has not finished. The work of our church both nationally and locally, requires our bodies and it also requires our giving so that the work can continue. I ask you, to please consider what sacrifice you can make in your budget, whatever the dollar amount, so that you too can pledge to make a difference in the work we do together as agents of justice and advocacy, speakers of truth and peace, and witnesses to the love of our God. The world needs the church, and the church needs you.